The Fourth Industrial Revolution is here. What laws do we need to make sure we all benefit from it? How should we create the rules that will unlock the benefits of the Fourth Industrial Revolution? The Fourth Industrial Revolution is upon us, but if we don't govern it properly then its full economic and social potential will not be realised. So how do we create legal infrastructure for something that is so new and complex, asks Gillian K Hadfield, professor of law and economics at the University of Southern California and author of Rules for a Flat World: Why Humans Invented Law and How to Reinvent It for a Complex Global Economy. 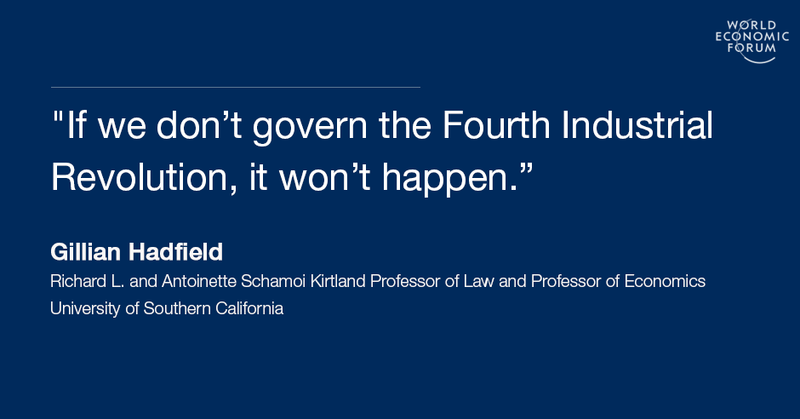 Why does governance matter for the Fourth Industrial Revolution? Because if we don’t govern it, it doesn’t happen. There’s a common assumption that economic progress happens regardless of what the governance environment looks like. The thinking goes: the Fourth Industrial Revolution will happen anyway. And if we can figure out how to govern it, it’ll happen better. Governance is seen as the icing on the cake. I think that’s the wrong perspective. Think of governance as a form of infrastructure – legal infrastructure, the mostly invisible platform of rules and practices that underlie all our economic activity and social interactions, that allow us to cooperate and plan. Like other kinds of infrastructure, it’s a sine qua non of economic progress. About four billion people in low-income countries don’t have good legal infrastructure, and that’s part of the reason they’re still low-income countries. Legal infrastructure in advanced countries worked well enough for pre-computer nation states, but isn’t doing a good job of keeping up with a hyperconnected, rapidly-changing world. Who will be the key players in building the legal infrastructure we need for the Fourth Industrial Revolution? That’s an often-overlooked question. There tends to be an assumption that the hard part about governing the Fourth Industrial Revolution is agreeing on what we’d like our rules to say. But then comes a harder part – actually delivering on those rules, when the space you want them to govern is so new and complex. Governments tend not to have the necessary expertise. Innovators do, but self-regulation has its limits – history teaches us that markets work best when appropriately regulated by accountable institutions. Are any new trends emerging to solve this conundrum? For a couple of decades or so we’ve had what’s called “new governance theory” – the idea that governments don’t write rules themselves, but define what they want rules to achieve and ask the entities that are going to be affected by the rules to write them. The “right to be forgotten” is a good example of that. Europe’s courts decided that people should have the right to get references to them hidden in online search results. But how do you do that? Google is in a much better position to know than any government. So essentially the court said to Google: “here’s the required outcome, you figure out how to make it work”. You can take that a step further and have governments say to private sector bodies: “You figure out what the risks are and tell us what you propose to do about them”. But my thinking is that actually we need to introduce some competition and innovation into this process. I propose we get third parties into the business of providing legal infrastructure. Take the example of self-driving cars, which a lot of jurisdictions are currently debating how to handle. There are all sorts of issues we’ve never had to think about before. What evidence of risk management do we require before letting self-driving cars on our roads? Who’s liable when something goes wrong? Instead of governments trying to write the laws themselves, or asking self-driving car companies to do it, suppose we had three or four or five private bodies saying: “Here’s a set of rules for self-driving cars that achieve the outcomes governments have set”. They’d have to persuade self-driving car manufacturers to sign up to being regulated by them, and to persuade governments to approve them. That creates incentives for innovation of more effective and less costly ways of achieving goals and making sure the results are accountable to the public interest. What would be the self-driving car-makers’ incentives to sign up? Well, governments can require them to sign up. But more than this: they want rules. There’s a common misconception that private companies want to be left alone by governments to do whatever they like. That’s not true. If you’re a self-driving car maker, you want the public to have confidence getting into self-driving cars. You want investors to have confidence putting money into self-driving cars. And that’s not going to happen if, through lack of rules, you risk a spate of accidents and bad publicity. In the Fourth Industrial Revolution we’ll have lots of these situations, where players in emerging fields actually want to define constraints because those constraints will create value for them. The question is what’s the best way to define the legal infrastructure that will create most value. How do you envisage the governance of the Fourth Industrial Revolution looking by 2030? There’s a lot of pressure for globally harmonized rules, and it’s easy to understand why – if you’re a global company, it’s frustrating to have to deal with a hundred or more different sets of regulations. Companies want to be able to say – for example – “we’ve been approved in Germany”, and for Japan and the US and UK to say “that’s good enough for us”. I can envisage that by 2030 we’ve taken that to the next level, and, as I argue in my book, harnessed market incentives to create globally competing private providers of regulation to govern the Fourth Industrial Revolution – governments can choose which regulators to approve, and companies can choose which approved regulator to abide by. That would really help the advanced economies seeking to maximize the benefits and address the risks of the Fourth Industrial Revolution. But it also creates real value for the four billion people around the world whose lack of legal infrastructure is currently keeping them poor and who are likely to remain locked out of the benefits of the Fourth Industrial Revolution.